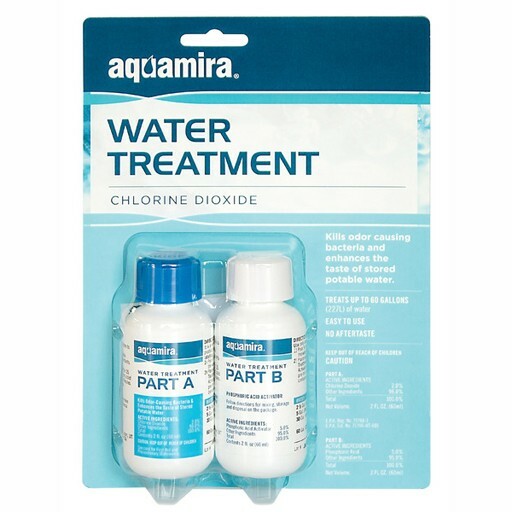 Water Treatment Drops by Aquamira® utilize chlorine dioxide to treat large batches of water. The economical 2 oz. size is perfect for treating stored water in 55 gallon or smaller drums. It is also ideal for treating water in RV storage tanks, on site water storage tanks such as cisterns or camp water systems and WaterBasics™ Water Storage Kits. Aquamira Water Treatment Drops treats drinking water using chlorine dioxide to kill bacteria, control the build up of slime and improve the taste of stored water.